'Der Kommissar' was originally a hit for Austrian singer Falco. Written by producer Robert Ponger for Reinhold Bilgeri, Bilgeri turned down the song, and Falco reworked the track and recorded it. The single reached number 1 in German-speaking countries in January 1982. 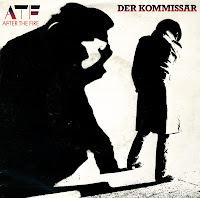 This version by After the fire was recorded in English in the Summer of 1982. The single didn't do well in the charts, and the band split up at the end of the year. Then, in 1983, Laura Branigan recorded another cover version, called 'Deep in the dark', which was prepared for release, when the After The Fire version finally hit the U.S. charts on February 22, 1983, and started rising. It ultimately rose to number 5. After The Fire's record company, CBS, pleaded with the band to regroup, but to no avail. At the time of buying, I only knew the original version by Falco, and I was curious about this one. It's weird to hear an English version when the German lyrics are so ingrained in one's memory. But it's a nice version nonetheless.